WASP on the WEB: Nancy Parrish, daughter of WASP Deanie Parrish, creates a website, using pages from her mother's 33 year-old WWII scrapbook. In less than a month, the site wins "Yahoo Pick of the Week. She expands the website and it becomes an award winning, interactive web site, containing the largest collection of digital information about the WASP in the world, with over 2,000 pages of WASP records, videos, pictures, articles, games and marching songs--plus paper dolls and coloring pages for young children. As a PBS Producer, Nancy begins documentary research and discovers very little information on the WASP. After convincing her mom, the WASP, to join her, she formulates a plan to interview WASP for a possible documentary. Dr. Corey Carbonara and Dr. Michael Korpi, Baylor University Film & Digital Media., embrace the idea and encourage a meeting with Dr. Cheryl Warner, Associate Dean of the Baylor Graduate School. Dr. Warner’s enthusiastic support leads to the first formal proposal and permission (although is not required) from the National WASP WWII President, Marty Wyall. Proposal: “THE WASP PROJECT,” to document and preserve the history of the first women in history to fly America’s military aircraft, the WASP of WWII is presented to Baylor University Vice President for Development, Dr. Richard Scott, who offers guidance in helping get the funding started. Development suggests a name change, because the perception of the word WASP is negative. Nancy renames the project “WINGS ACROSS AMERICA.” Allison Abercrombie, University Development artist, helps create the first Wings Across America brochure. Terry Roller, Baylor professor, designs a logo. Baylor University Chancellor, Herbert Reynolds agrees to serve as Honorary “Chairman of The Board.” Dr. Michael Korpi and Dr. Corey Carbonara at Baylor’s Film and Digital Media Dept. offer their technical support. Nancy Parrish becomes Executive Director, Deanie Parrish becomes Associate Director. Letters are sent to each of the more than 600 WASP, inviting them to participate in the project, to be interviewed on digital videotape in the privacy of their own homes. Twenty-seven PBS stations in twenty-two states volunteer to help with the interview process. Wings Across America is featured on the back cover of the Baylor University Business School’s magazine, "Baylor Business Review." Marketing Class interns create proposals for more recognition of the WWII service of the WASP. WASP Anita Paul, now a Carmelite Nun, who lives on the Island of Guadeloupe in the French Antilles, receives special permission from Rome to travel to Waco to be interviewed at Baylor’s TV studio. Her arrival brings new publicity to the young project, as she lands on the front cover of the Waco Tribune Herald. Baylor University honors WASP Ruth Helm in the 1999 Homecoming Parade. An A-26 and (2) AT-6’s, fly over the parade for Wings Across America in honor of the WASP. Dr. Corey Carbonara, as Associate Vice President for Technology Management offers Wings Across America editing space in his offices at Baylor’s Clifton Tower. Dr. Nancy Upton agrees to serve as an advisor and sets up a presentation to the Baylor University Board of Regents. The presentation and a subsequent meeting with Baylor President Robert Sloan are successful. Wings Across America’s Digital Video Archive eventually grows to over 300 hours of recorded digital video interviews with over 100 WASP. This unique collection is the cornerstone for educational projects to come. Nancy Parrish's “Wingtip to Wingtip” is published. in “One Hundred Years of Powered Flight" w/ forward by H.R.H. the Duke of Edinburgh. “Marching Songs of the WASP” are produced, with volunteers from the Baylor chapter of Kappa Kappa Gamma. Project is recorded in the Baylor studio. Baylor University’s James Connally AFROTC Detachment creates a ‘Homecoming Parade Float’, featuring WASP Deanie Parrish, to honor the history of Air power. Nancy shares her vision to create a WASP museum where most of the WASP trained--by traveling to Sweetwater and speaking to the Rotary, the Chamber and eventually, the City Council. She creates the non profit: National WASP WWII Museum, forms a Board, serves as Director, leads the national membership campaign, designs the exhibits and produces the opening ceremonies--2005. Deanie serves on the BOD and is Facilities Chairman. Wings Across America is invited to the NAAA Convention in Reno, Nevada . A small traveling exhibit is created to showcase the WASP history. Campaign is initiated for the induction of the WASP into the Texas Aviation Hall of Fame. It is successful, and the WASP are invited to the induction ceremony. Wings reaches out to the Texas Historical Commission resulting in the WASP and Avenger Field being included in the new “Texas in World War II” brochure. WASP Deanie Parrish, together with the Governor of Texas, is invited to speak on the steps of the Texas State Capitol in Austin. Voice of America visits the Wings Across America offices and videotapes an interview with WASP Deanie Parrish. Wings Across America proposes the ‘Adopt A WASP’ Joint National Project for the Arnold Air Society and Silver Wings Detachments across the US, with Baylor AFROTC Cadet, Claire Kultgen. The project is approved unanimously, and Wings Across America co-sponsors the project, providing local WASP information and educational resources for individual AFROTC Detachments and collaborating co-ordinating with over 100 WASP across America for the next year. National WASP WWII Museum officially opens at Avenger Field. Exhibits, designed by Nancy and including Deanie's thirty-six foot WASP Timeline, are installed in the 100 year old hangar where the museum is located. Nancy produces the opening ceremony: 29 WASP put their hands in cement and a Memorial Flyover and parade honor the WASP. Wings Across America travels to the Pentagon for the dedication of the Air Force Memorial, setting up an exhibit in a designated tent in the parking lot and sharing the WASP history. Nancy Parrish's article, , “Above and Beyond with Flying Colors,” is published. in “USAF Founding Centennial & 60th Anniversary” with preface by President George W. Bush, forward by Michael W. Wynne, and introduction by Gen. Michael Mosley. The “FlyGirls of WWII” WASP Exhibit is created for the Mayborn Museum Complex, and opens September 15, 2007. The exhibit ‘run’ is extended twice, closing on April 1, 2008. Deanie begins a campaign for national recognition for the WASP, writing a proposal and reaching out to Baylor grad, John C. Truesdell, Deputy Undersecretary of the Air Force for Reserve Affairs. “FlyGirls of WWII” is tripled in size, packed up and shipped to Arlington, Virginia, where it is installed at the Women in Military Service To America Memorial at the gates of Arlington. It opens November 14, 2008, and is extended to April 1, 2010. Deanie’s campaign for national recognition, via Congress awarding the WASP the Congressional Gold Medal, is joined by White House Fellow, Maj. Nicole Malachowski, first female Thunderbird pilot, who writes a draft Bill. Deanie is invited to speak on behalf of the WASP at the Veteran's Day Celebration in Dallas with Kay Bailey Hutchison. Senator Kay Bailey Hutchison agrees to sponsor Senate Bill: S.614, and Wings Across America becomes the official hub of the national grassroots campaign for the WASP to be awarded the Congressional Gold Medal. 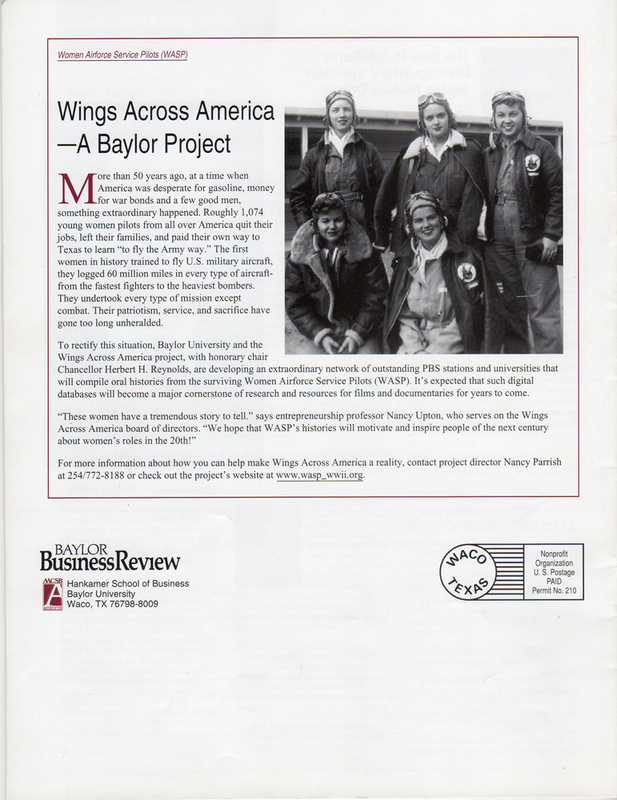 Wings Across America is featured as the cover story “Women in the Wings” in the fall edition of Baylor Magazine. Congressman Chet Edwards commends Wings Across America for work honoring the WASP in the Congressional Record. Nancy’s first book, “WASP In Their Own Words,” “An Illustrated History Of The WASP” is published. Wings Across America co-ordinates press releases and information for news outlets across America, encouraging stories on their local WASP. The publicity campaign, which is soon expanded from the grassroots campaign to a national campaign to award the Congressional Gold Medal to the WASP, is successful, with interviews and featured stories at (by) CNN, ABC, NBC, FOX NEWS and PBS. Nancy is appointed “Official Congressional Liaison” to the US Mint for the design of the WASP Congressional Gold Medal. Appointed by Sen. Kay Bailey Hutchison, Sen. Barbara Mikulski and Rep. Ileana Ros Lehiten and Rep. Susan Davis. Stars and Stripes Special Edition for the Gold Medal Ceremony on the WASP features Wings Across America's graphics and Deanie's WASP Bios. NBC’S Today Show sets up in front of the FlyGirls Exhibit at the Women’s Memorial and Jenna Bush Hagar interviews three WASP. A special invitation to dinner with the Chief of Staff of the Air Force gives Wings Across America a unique opportunity to share the WASP with a great WASP champion, Gen. Norton Schwartz and other remarkable guests. Wings Across America’s “FlyGirls WASP Exhibit” is put on permanent display at the Kalamazoo Air Zoo in Kalamazoo, Michigan. A brand new “FlyGirls WASP Exhibit” is created and put on temporary display at the Wings Over the Rockies Air and Space Museum in Denver, Colorado. “FLYGIRL WWII” -- the FIRST WASP APP -- is created and published in Apple’s app store.